Former Bayern Munich manager Felix Magath has bought around a 1% stake in Rangers International Football Club. He purchased the shares late last year, and has held discussions with one of the groups vying for control of the club, but it is not Robert Sarver. Magath has no ambition to succeed Ally McCoist as Rangers manager, but does want to rebuild the club's football infrastructure as technical director. 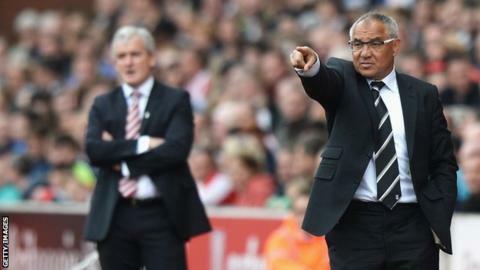 The German's last job was as manager of English Championship side Fulham. The 61-year-old was sacked by the London club in September after a poor start to the season. He still, however, remains widely admired in Germany for his work at several clubs, having won the Bundesliga title twice while in charge of Bayern and once as boss of Wolfsburg. When asked, Magath refused to answer questions about his possible involvement with Rangers. "I don't want to comment on my stock dealings, that's private," he said. "I spent the Christmas holidays in London and actually visited someone in Glasgow but I don't want to comment on whether there has been talks with the club either." With Magath being linked with a revamp of the club's scouting network and youth system, interim Rangers manager Kenny McDowall insisted an overhaul of the behind-the-scenes set-up is long overdue. "Since the club went into the trouble that we are into, we have been operating without a scouting team," he said. "The whole thing has got to be addressed at some point but at the moment there is nothing. We have two people doing match reports for us. Obviously they do a bit of scouting for us as well. "We have got contacts in the game ourselves and that's what we've been relying on. "This is such a big club and these things should all be in place. Hopefully we will get back to being the way we should be."